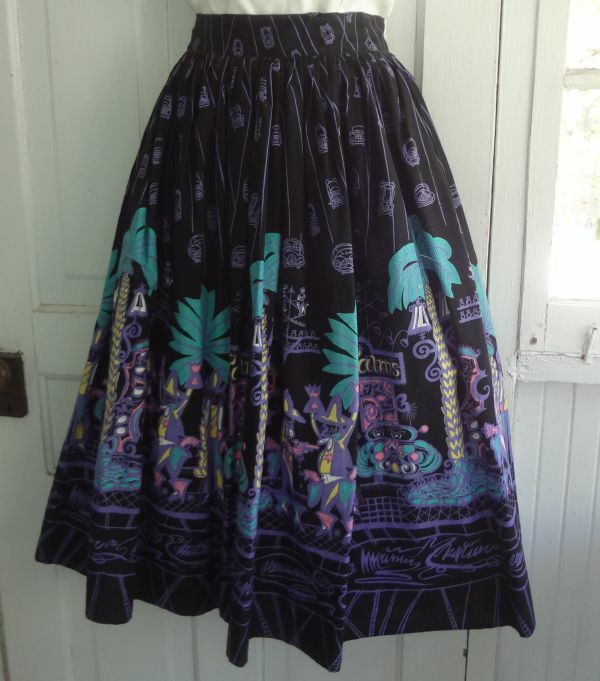 I think that at some time or another I’ve shown photos of the skirts in today’s post. But after showing these on Instagram I realized I needed to write a little about artist Saul Steinberg and this line of skirts. You may know Steinberg from the many covers he made for The New Yorker. 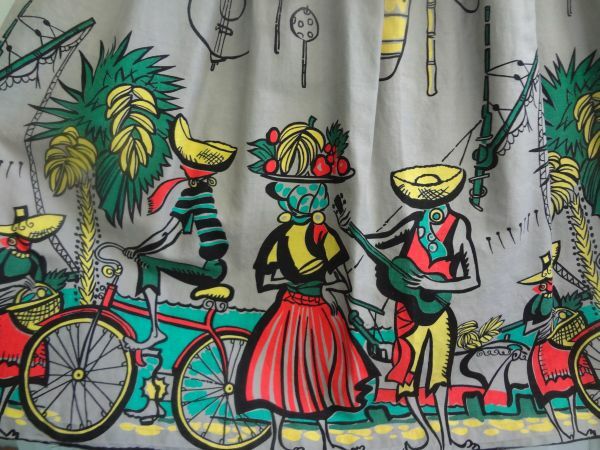 Lesser known were the textiles he designed in the 1950s. 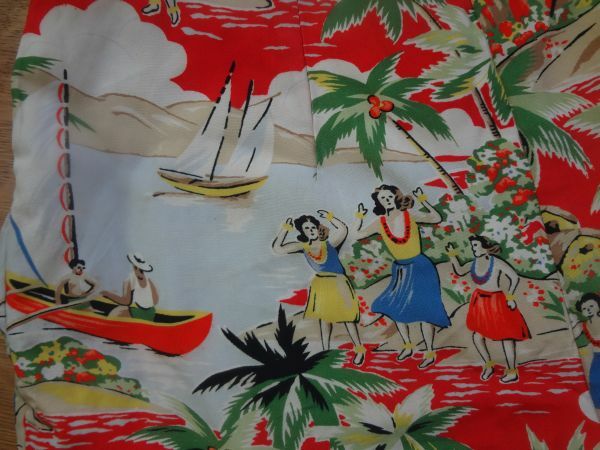 Starting in 1946 Steinberg designed a line of home decorator fabrics and matching wallpapers for Piazza Prints. It was supposed to be an exclusive contract, with Steinberg designing only for Piazza, but somehow he entered into agreements with at least two other firms. One was another maker of home decorating fabrics, but the other was a producer of dress goods. Probably because he was in violation of his contract with Piazza, Steinberg’s name does not appear on the garment weight goods. All of this information was researched for the book and exhibition Artists’ Textiles: 1940 – 1975. The information about the two “illegal” lines was uncovered in the correspondence between Steinberg and Piazza representatives. 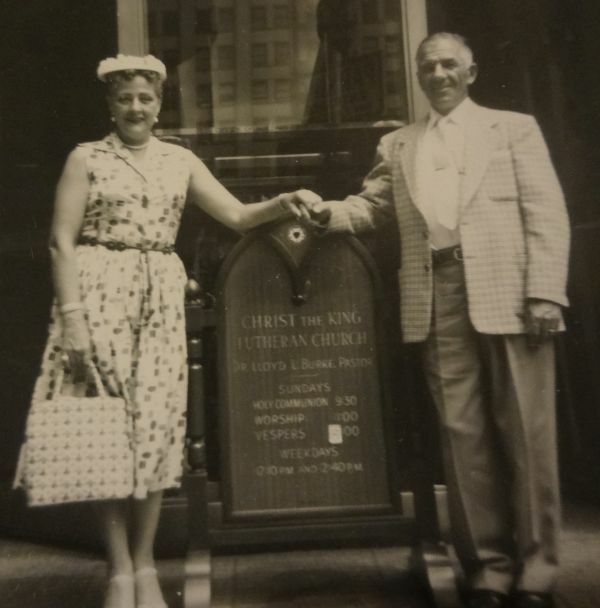 Piazza did not care about the dress goods fabrics, as they were not their competition. They were upset at the other lines, as it was a competing company located just blocks from them in the garment district. The dress goods are all, as far as I know, labeled Regulated Cotton “Never Misbehaves”. Also included is the name of the print. This modern day cowboy goes to Vegas scene is titled “Tin Horn Holiday”. 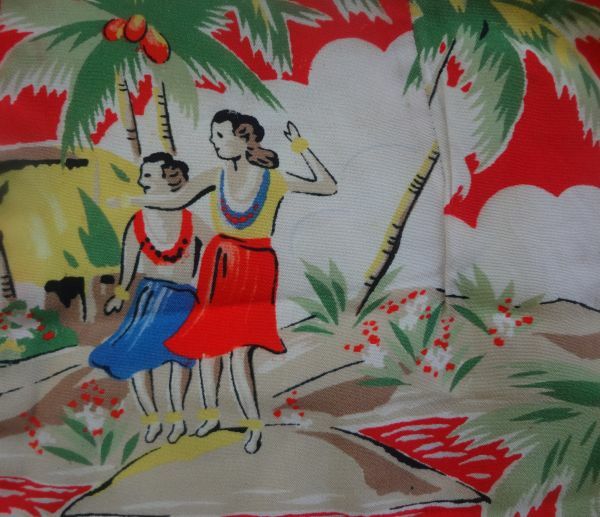 I know nothing at all about that company but some of the fabrics have been found in 1950s JC Penney catalogs. Like many of the fabrics in the past, yardage was available to both home sewers and to manufacturers of clothing. The Steinberg prints are pretty easy to recognize, as most of them have some features in common. 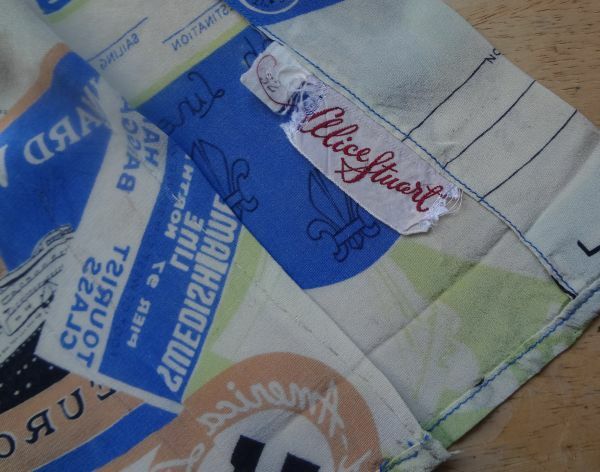 One end of the selvage, which is the bottom of the print, has a border that is not part of the narrative. Above you can see random lines along with scribbles that sort of look like words, but don’t actually say anything. Above that is the story, in this case of a cowboy and bandit, two cat-eyed ladies in a big ole car, palm tree street lights, and a resort casino sign. Parts of the motif are carried upward into the background. Here you see lots of little cars, probably traveling in for a holiday. As was common, this print came in at least five different colorways. 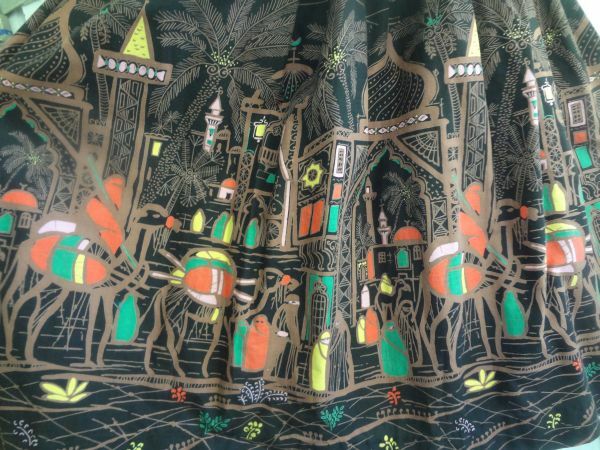 This print is, I think, called Casbah. Steinberg had spent time in North Africa, and he made a similar drawing during his visit. 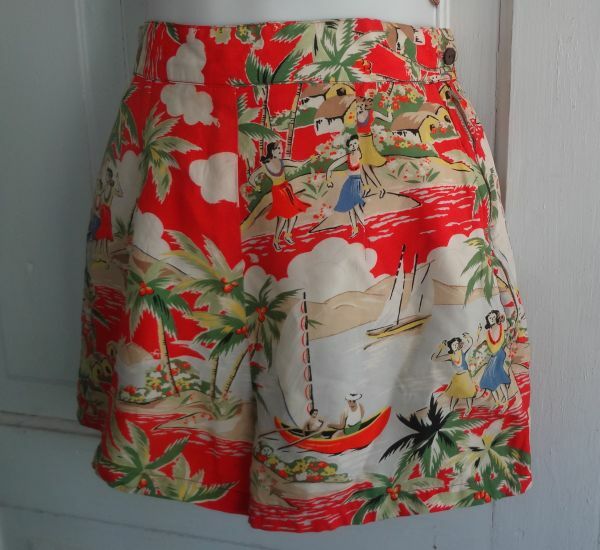 This print follows the pattern of hem border, the main story, and then the palm tree motif repeated near the top. 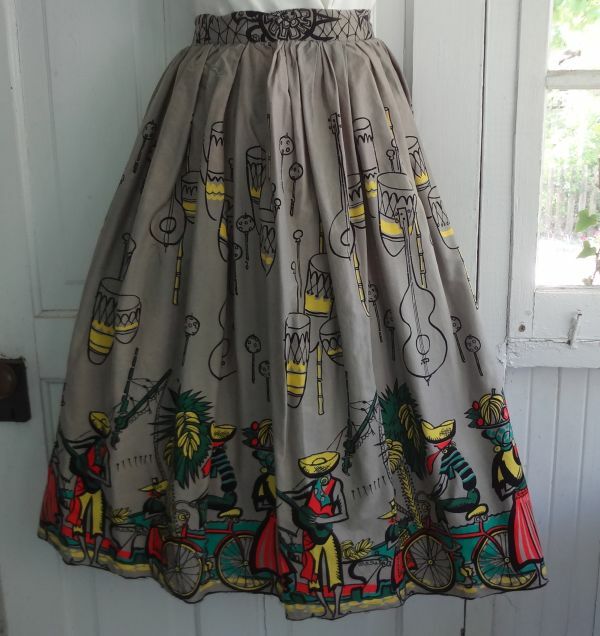 This print also came in white, with red, gold, and blue accents. 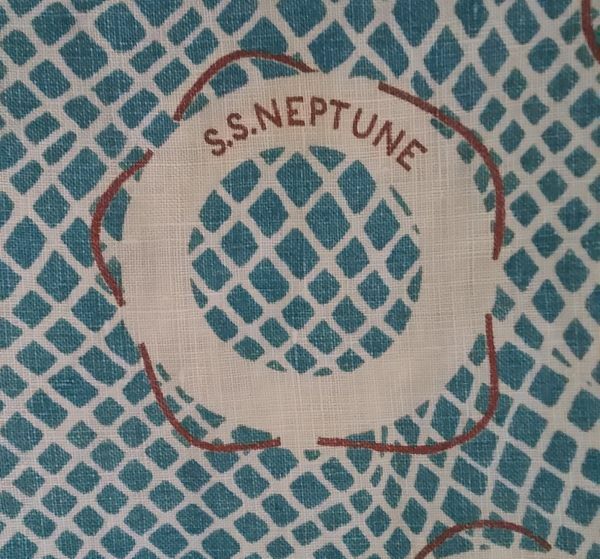 This print had the selvage removed during its construction, so I can only guess at a name. How about Cuckoo? And I love that goat so much. 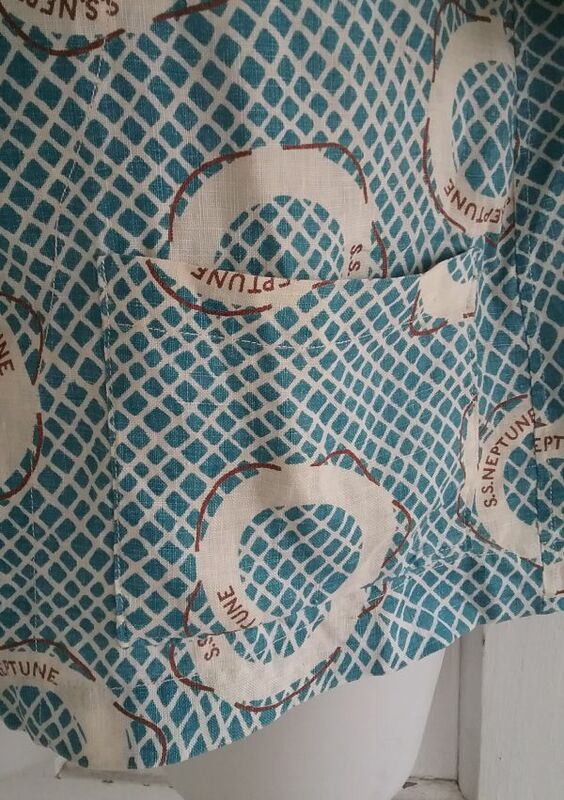 In making this skirt, the sewer used the bottom border to make the waistband. A complete version has sea turtles at the hem. 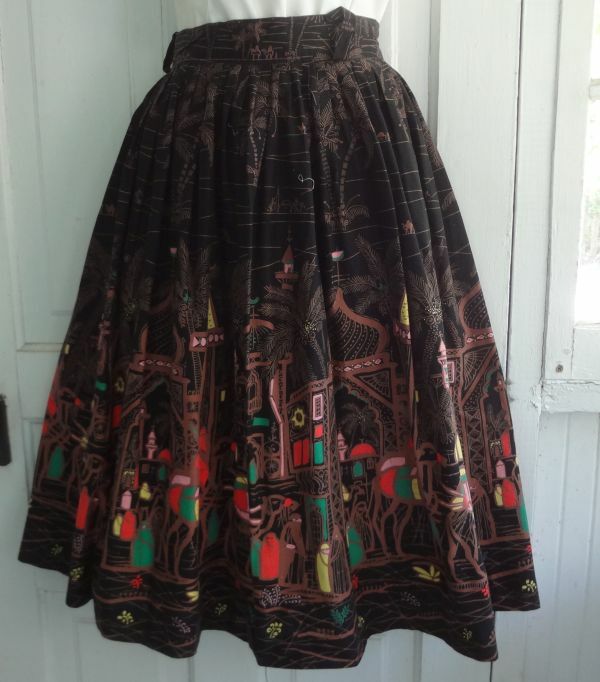 I’ve seen this print with a black background with bright colors, and someday this skirt will be replaced with that version. Instagram user gday321 posted a photo of himself wearing a cabana set – swim trunks and matching shirt – made from this print in white with bright colors. He found his set pictured in a 1958 Sears catalog. 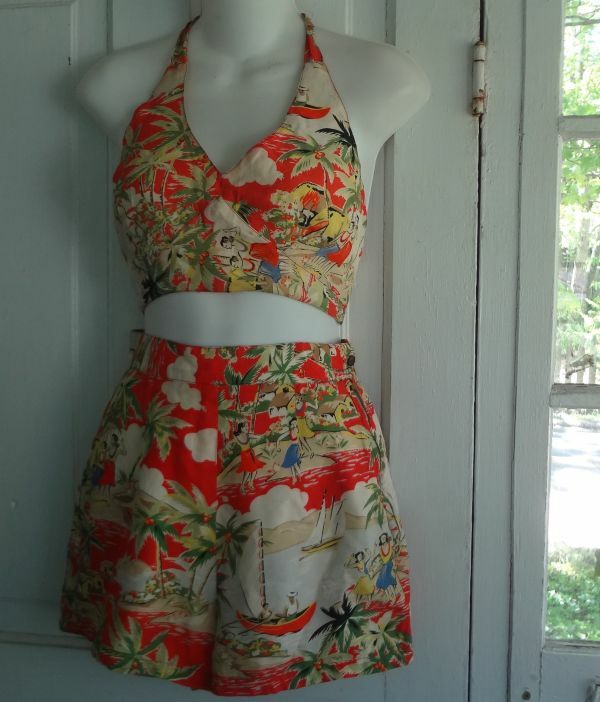 I’ve seen this print referred to as Calypso, though I do not know if that is the actual name. 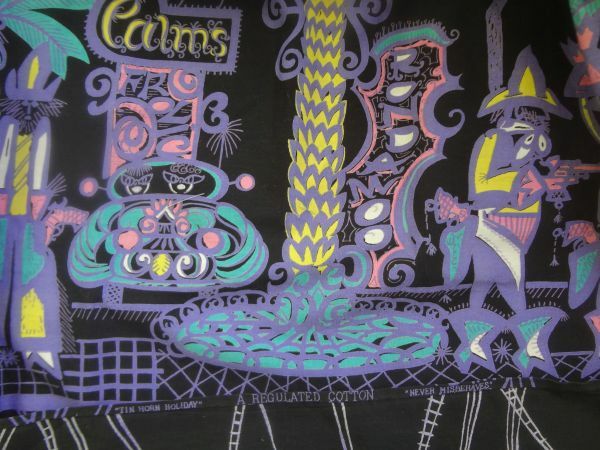 This last print has been identified as a Saul Steinberg design, and it does look like his work. It is a bit different in that the background is not filled in with a smaller motif. All the Steinberg prints seem to have travel based themes, or at least travel destinations for American tourists. There are several more besides the ones in my collection. An English fox hunting scene has the fox sitting on a “No Hunting” sign while surrounded by hunters on horseback and their hounds. 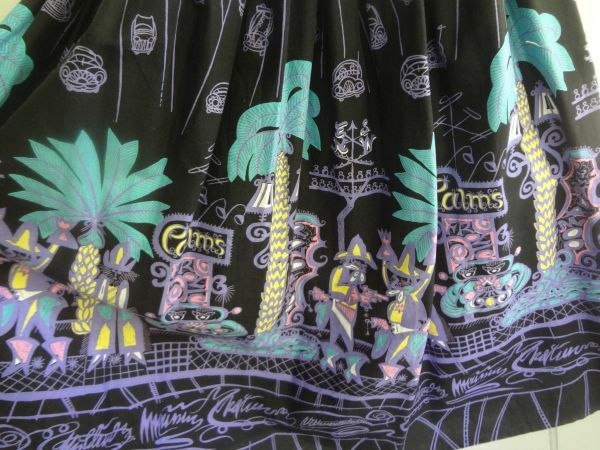 A Florida themed skirt called “Cypress Gardens” has water skiers and speed boats. There are two prints that feature trains, “Paddington Station” and one known as simply “Train.” One of the most elaborate designs is a scene in an opera house. There is one that features a roller coaster in an amusement park. There is one that looks like Innsbruck, with a procession of antique fire engines, and another that looks like Switzerland with people in folk costume and a Saint Bernard dog with his little cask of rum. There could be others, as some of these are rarely seen. 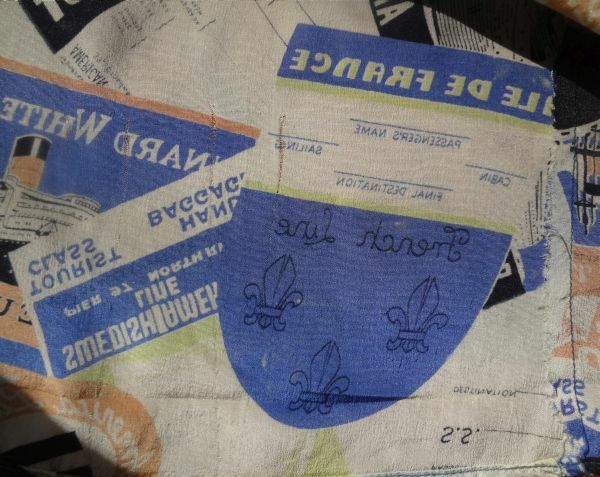 I’m thinking Steinberg must have made more than a little pocket change from these fabrics, as some of them were obviously very popular, especially Tin Horn Holiday. Hopefully more research will be made and more details will come to light about these fantastic fabrics. Artists’ Textiles 1940 – 1976, by Geiff Rayner, Richard Chamberlain and Annamarie Phelp is a great book. Read it. 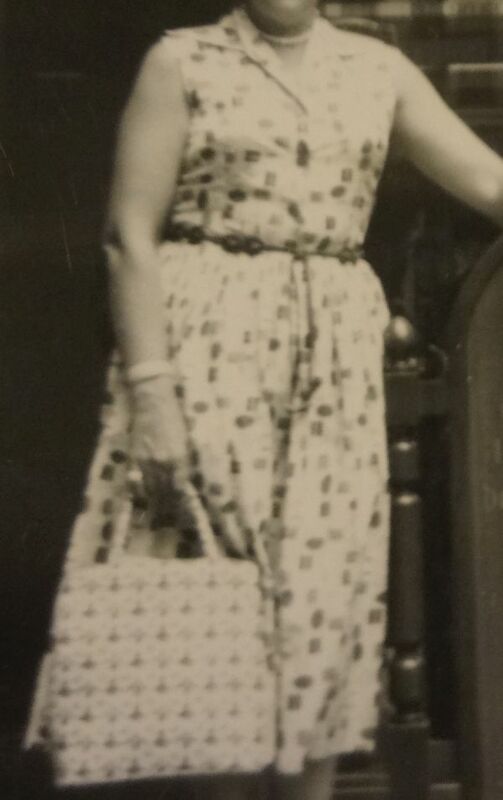 I realize after looking at this photo that I should have taken the time to try and do a better job of showing just how lovely this late 1940s or early 1950s blouse is. I’m hoping the details will show the special-ness of it. Every so often the question will arise on vintage clothing chat board, “What makes a garment museum quality or museum worthy?” There’s no easy answer to the question, and it depends on the museum and the collection housed within. For example, the Costume Institute at the Metropolitan Museum of Art might turn up its nose at a rather plain mid-nineteenth century dress made and worn by a woman in Kansas, but that same dress might be an important part of a museum that interprets the history of that state. When it comes to adding something to my own collection, I have several things to think about. “Museum quality” isn’t one of them, but “collection worthiness” is. An item has to not just fit into my theme of sports and travel wear, it must fill a spot that is currently empty, or it has to be a better example of something I already own. 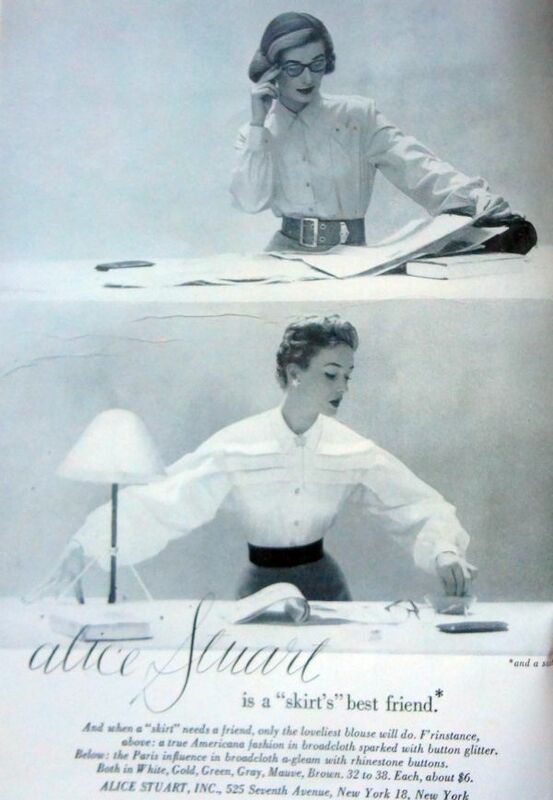 Blouses from the post WWII era are quite common, and I already have a few, including a navy one in rayon, so unless one is pretty special I’m not going to be interested. 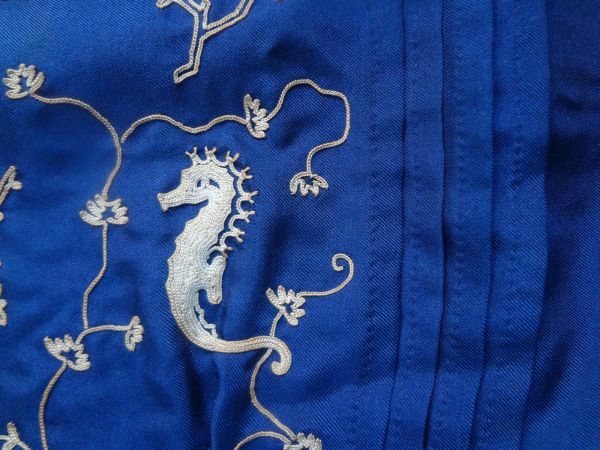 I love the under-the-sea theme of the embroidery with the seaweed and seahorses. But notice also the quality of the embroidery. This is tambour, which is done with a hook. 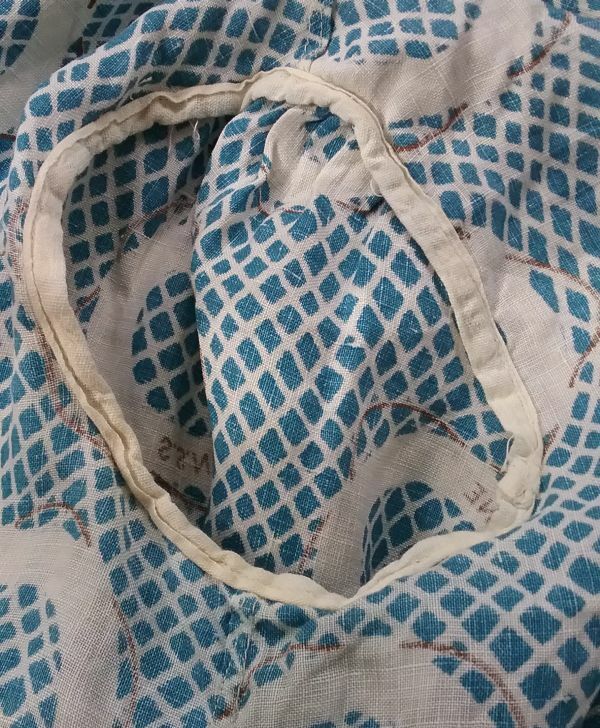 There is also a machine which can produce a good tambour facsimile, and I’m not enough of an embroidery person to be able to tell the difference. I’m guessing it is machine work because it is just so tiny. 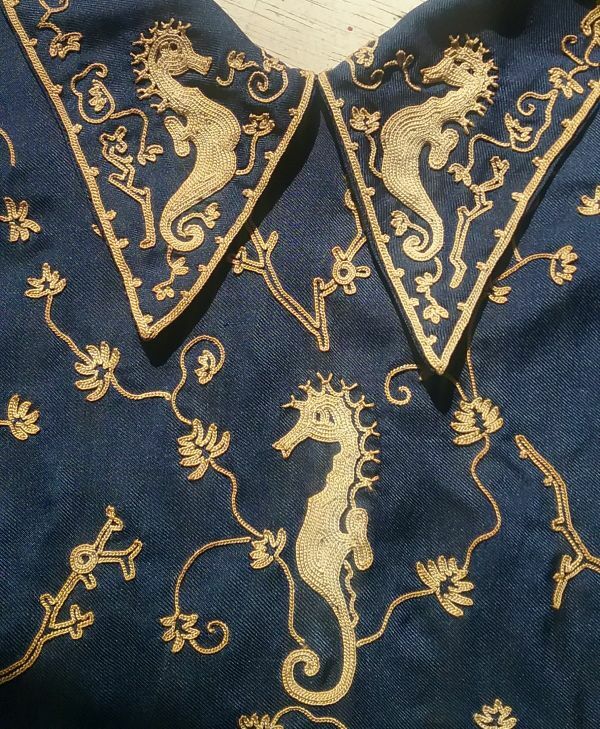 I can’t imagine it being done by hand, but expert embroiderers are magicians. All I can say is that the work is beautifully done, and the back is neat and lovely as well. This is the arm opening, and you can see the tambour that is applied to the band that secures it. 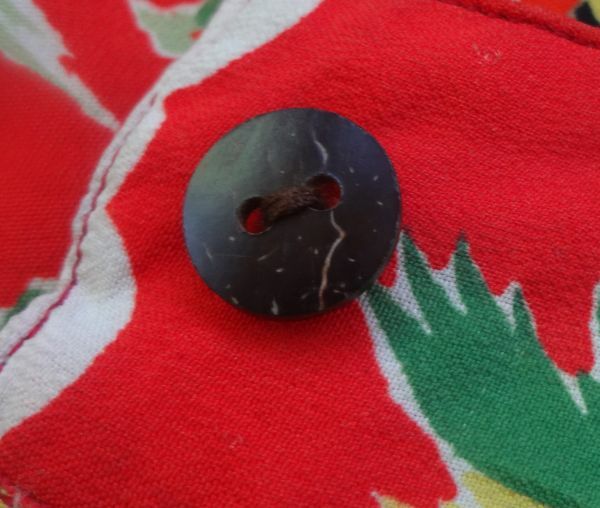 Also note the button, which is starburst-cut mother-of-pearl. I sort of wish the blouse were actually this color, but this is just my camera playing tricks again. 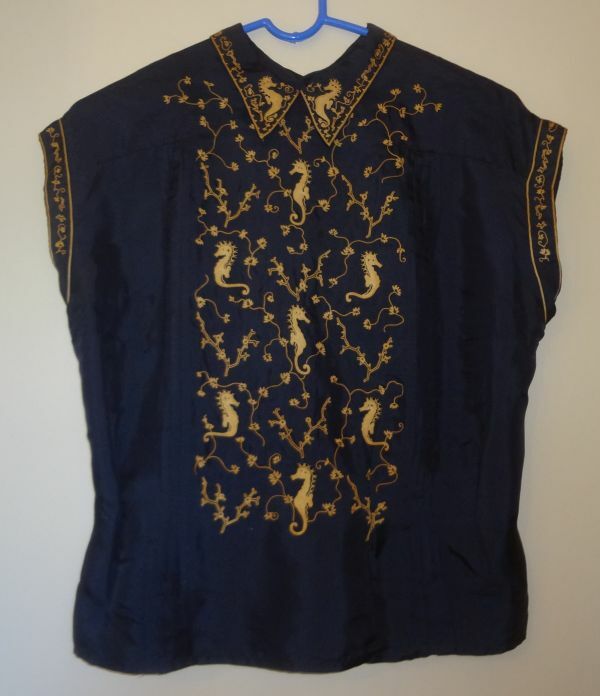 The blouse is navy. But I included this shot because I wanted to make sure the row of tucks would be noticed. You probably can’t tell, but they are actually stitched by hand. This blouse was meant to be tucked into a skirt or slacks, and to help keep it looking neat, there is a series of eight tucks (in addition to these decorative ones) all around the waist. 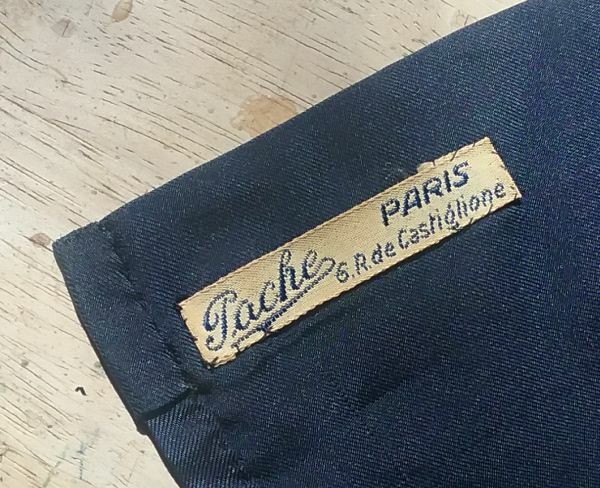 The label reads “Tache, Paris, 6 R. de Castiglione. The Rue de Castiglione is a shopping street that connects the Place Vendôme to the Tuileries Gardens. It’s a nice area of the city. Unfortunately, I have found nothing at all about Tache. I assume it was a store that sold pricey goods. Today, it appears as if there is a spa located in the space, which is across the street from a Weston Hotel. 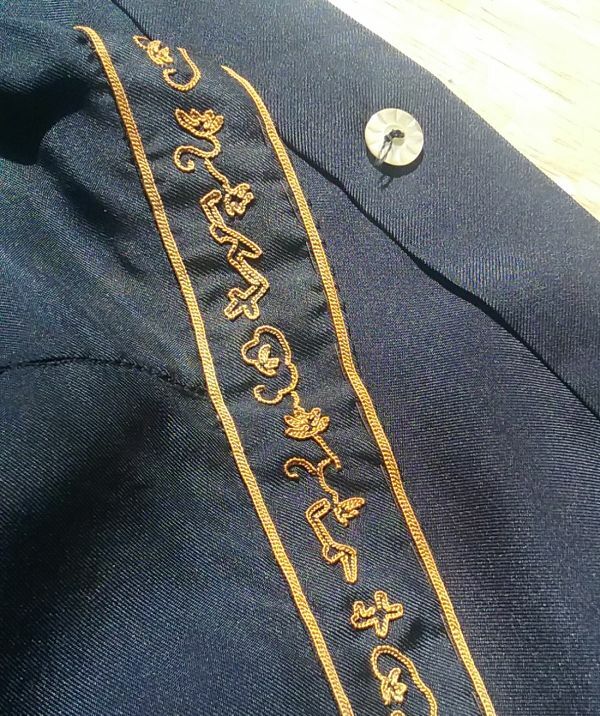 As would be expected on a garment of this quality, there is a mixture of machine stitching and hand finishing. The hem is hand stitched, as are the bindings at the neck and arms. 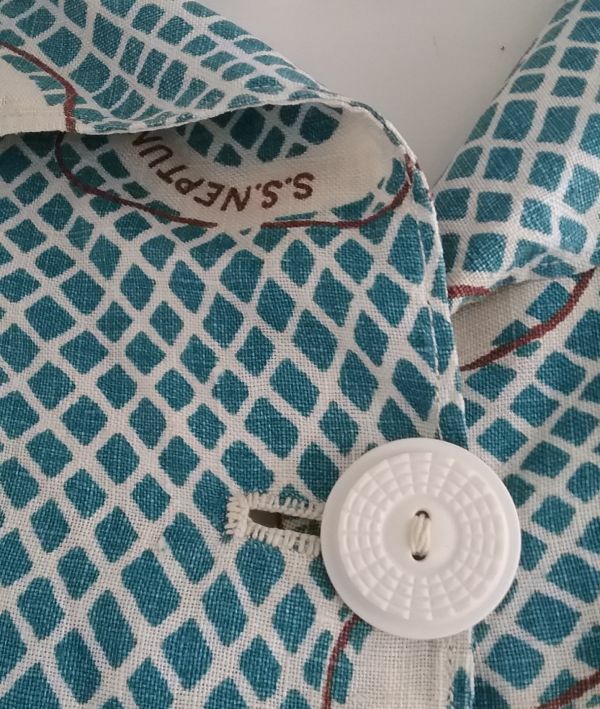 The machine-stitched side and shoulder seams are finished with a hand overcast stitch. I also consider condition when deciding on a purchase. I can deal with a bit of less-than-perfect-ness, especially if the garment is really good. Rarity also is considered. I’d want a 1960s sportswear piece to be almost perfect, but I’m willing to be a little less picky when it comes to a piece from the 1910s. In this case, the condition is very good, with one light spot and a tiny repaired hole. There are also some seams that have come loose. Those I’ll fix with basting. 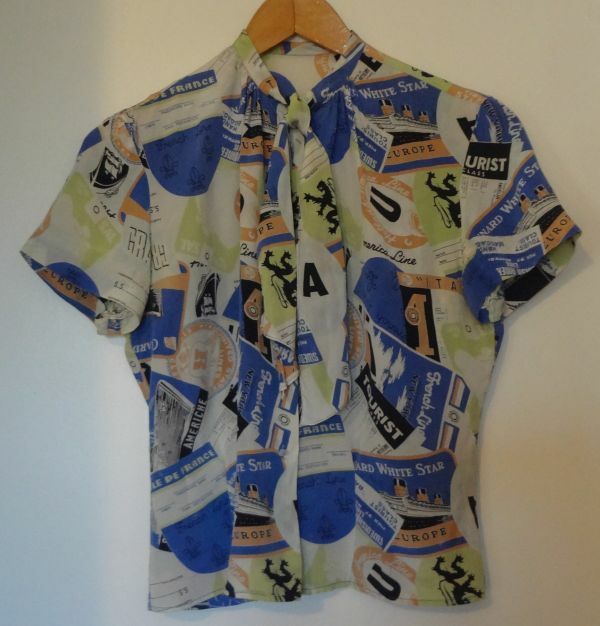 This was an item I spotted on Instagram, from Ballyhoo Vintage Clothing. Sellers, if you are not on Instagram, you might be missing opportunities to sell your stuff. 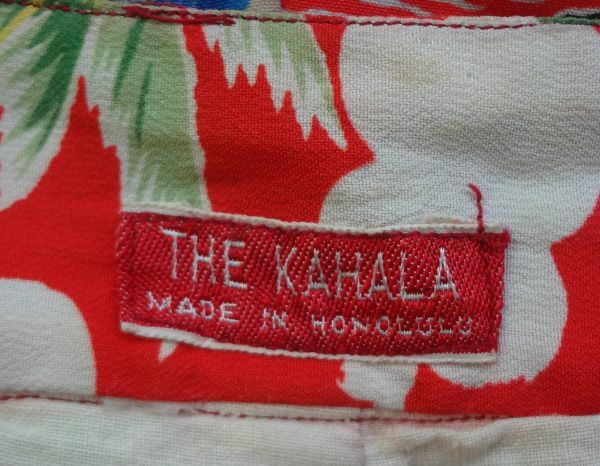 I recently found a stack of wonderful old linens at my favorite shopping place. As so often happens, a load of donations go in after the closing of an estate, or maybe a move to a smaller house. Anyway, I sometimes find the entire contents of the linen closet, and that usually means at least a few great novelty prints. 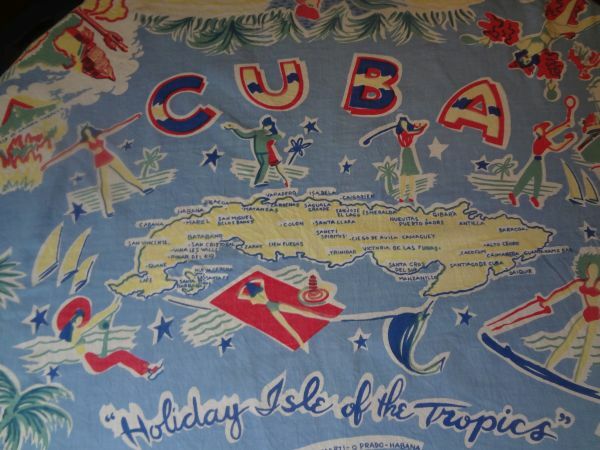 This souvenir tablecloth from Cuba was the best of a really sweet group of printed tablecloths. These tablecloths were very popular in the post WWII era, and I imagine that most homes had at least one – a Christmas theme cloth perhaps. I still have the one my mother used on our holiday table. 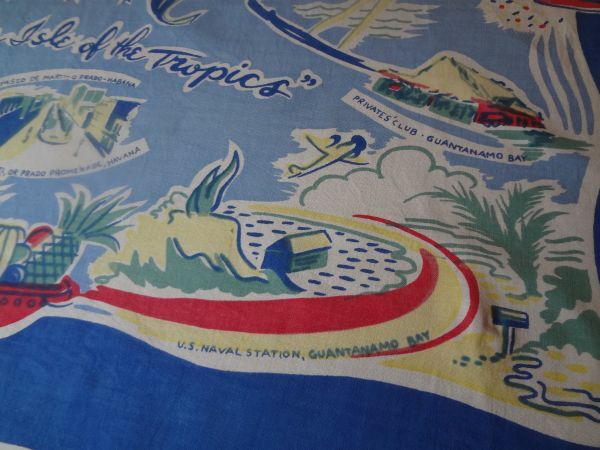 Tablecloths were also a great vacation souvenir, and I’ve seen printed ones with destinations from Alaska to Florida and beyond. 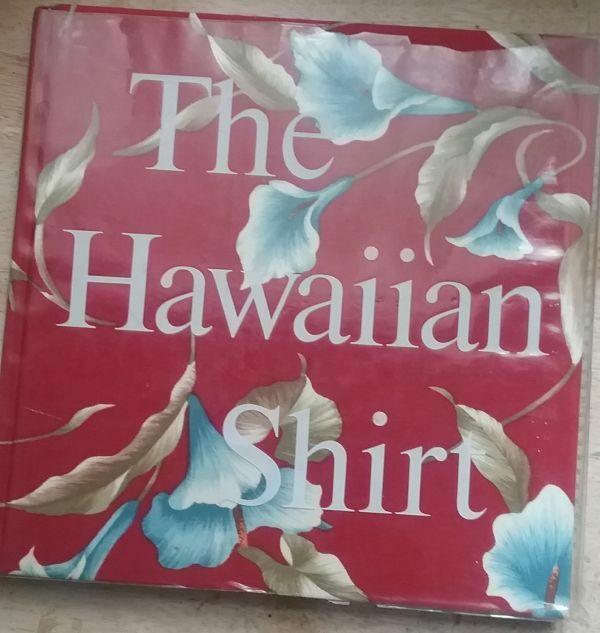 Most that I’ve found are not labeled, but I know of one company, California Handprints, that made novelty and printed tablecloths. 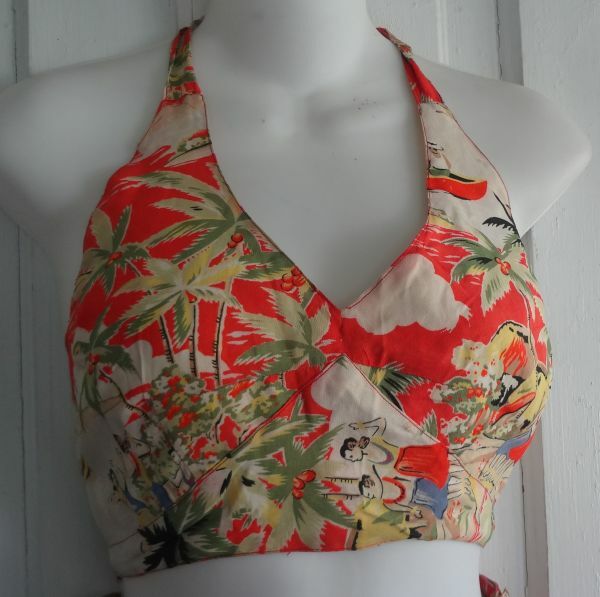 My guess is that this one, though sold in Cuba in the 1940s or 50s, was actually made in the USA. I was really happy to find the Cuba one, especially after checking the prices on Ebay. So I took a few photos, wrote up my listing, and put it on Etsy to sell. I also posted a photo on Instagram, where a fellow vintage travel enthusiast saw it. She emailed with the great news that she and her husband are traveling to Cuba soon. I clicked over to review my listing, but found it had disappeared. After a long search, I discovered that Etsy had deactivated the listing. 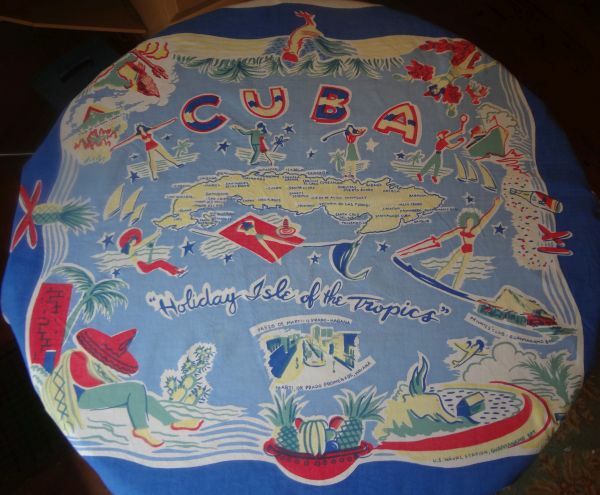 That was a bit puzzling, but the next day I got an email that stated that the tablecloth was in violation of the US embargo against Cuban products! 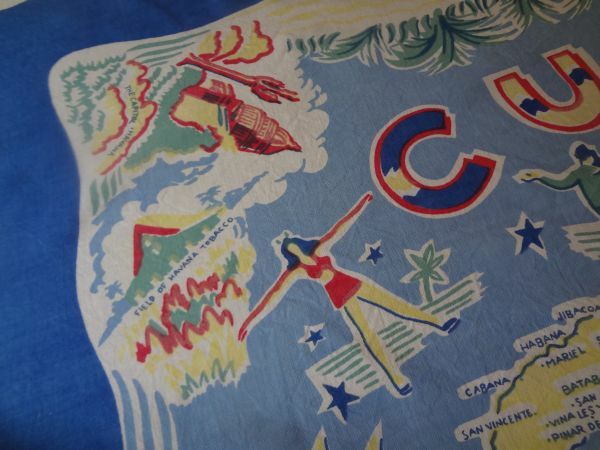 I sent an email back explaining that the tablecloth was made before the Cuban Revolution and the embargo. It was probably made in the US, and then imported to Cuba where a tourist bought it and brought it back to the States. In other words, it is not an illegal Cuban product. 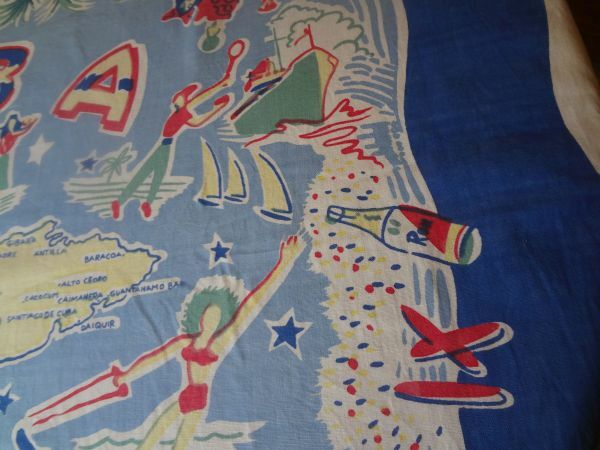 No matter, as the diligent people at Etsy can’t take a chance that the selling of my tablecloth might be the very thing that allows the Cuban government to break the (already weakened by US law) embargo. 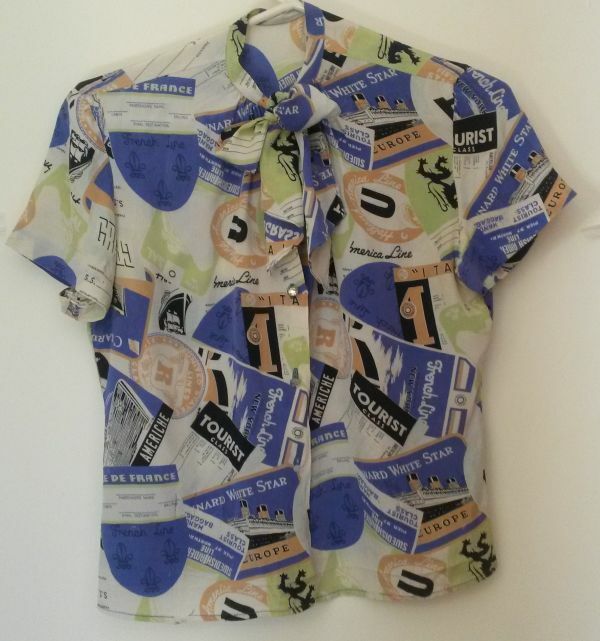 So my option was to stick it on eBay where there are several similar ones up for sale. But it just left a sad feeling, with my happy find turning into a problem. I had to find a way to break the evil spell cast upon my innocent tablecloth. 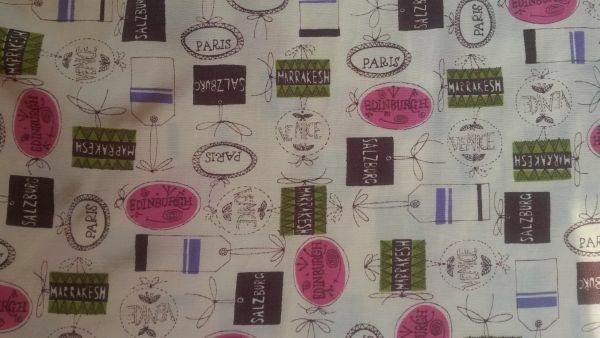 So now the tablecloth is on its way north, to the lucky Beth who will soon be traveling to Cuba. And by the way, the email from etsy’s legal department asked me to please keep our email exchange a secret. They are probably embarrassed for the world to know that legal communications are headed with “Hi there” and are signed with a first name only. Seriously. Cruise ships! Tennis! Skiing! Rum! Sailing! Dancing! Show girls! Tobacco fields! And a whole corner of the US Naval Station at Guantanamo Bay! I have opened my annual Etsy pop-up shop, in which I try to make a few bucks to support my collecting habit. 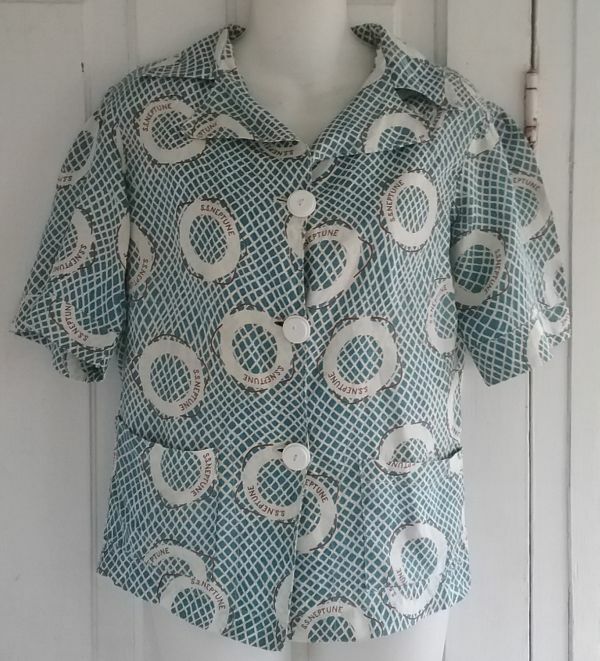 I sell vintage sewing patterns and other vintage finds from the past year that I’ve decided not to keep.